Stay in Usedom's best hotels! Located on the Baltic Sea island of Usedom, this superior hotel in Heringsdorf offers a spa with indoor pool, spacious rooms, and regional cuisine. The sandy beach is 98 feet away. Good breakfast and friendly staff. Featuring free WiFi, Aparthotel Villa Lea offers accommodations in Ahlbeck. Free private parking is available on site. The breakfest was good, eggs and bacon will very good. Coffee was strong and hot. Located in Peenemünde on the island of Usedom, Hotel garni Zur Zwiebel is surrounded by green lawns and is just a few minutes from the Baltic Sea. The hotel offers free WiFi to guests. The breakfast was good, and the front of house/manager was exceptional. Located just 328 feet from the beach, Hotel Villa Auguste Viktoria provides elegant accommodations. It is set in a historic building and features a popular confectionery café and free WiFi. 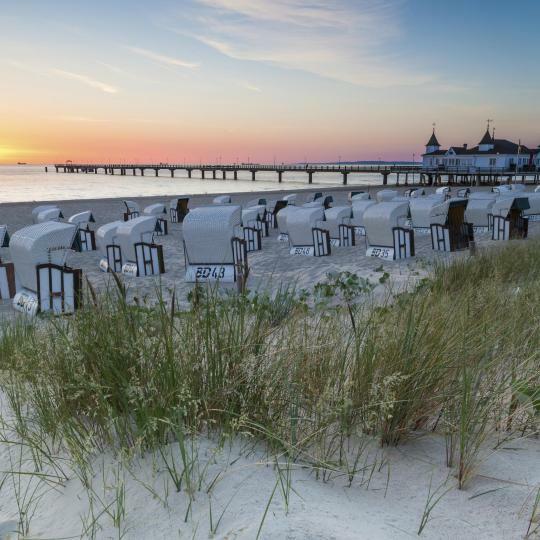 Located within 328 feet of the beach in Ahlbeck on the island of Usedom, this hotel enjoys stunning seaside views. Just 262 feet from the sandy Baltic Sea Coast, this hotel offers free Wi-fi and bicycle rental. Regional specialties are served in the restaurant, and guests enjoy private access to the beach. Warm welcome from hostess. Towels, bedlinen, kitchen towels all included. 3 bed apartment is super spacious and the shower fits 3 people. Very clean too. Gorgeous beach is behind the property. Every morning, even on Sunday the bakery in the hotel is open with many types of bread and cakes. Stylish, modern rooms with flat-screen satellite TVs are featured at this family-run 3-star Superior hotel, just 328 feet to Ahlbeck’s sandy beach on the Baltic Sea Coast. Quietly located between the scenic Achterwasser Bay and the sandy Baltic Sea beach, this hotel is 1640 feet from Ückeritz Train Station. Opened in 2016, SEETELHOTEL Kaiserstrand Beachhotel is set directly on the beach of Bansin. Guests can enjoy free WiFi, various restaurants on site as well as a relaxing sun terrace. Breakfast was super delicious and the location to the beach was great. Offering the Nautic SPA with indoor pool, free Wi-Fi, and an international restaurant with sun terrace, this nonsmoking, 4-star hotel in Koserow is an 8-minute walk from the sandy beach. Clean and somewhat close to the beach. 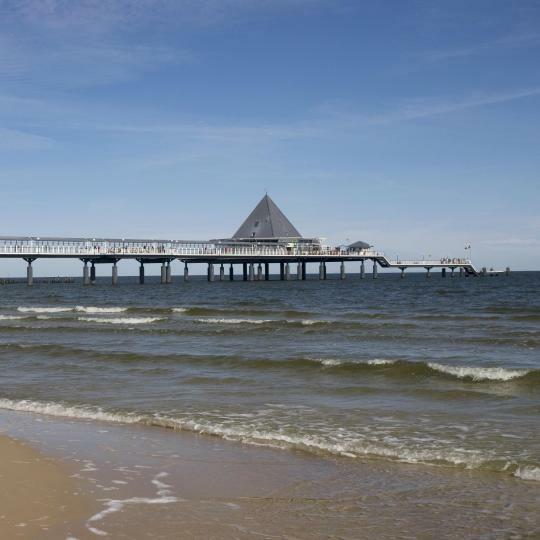 This hotel in Zempin is 328 feet from the Baltic Sea beaches on the island of Usedom. 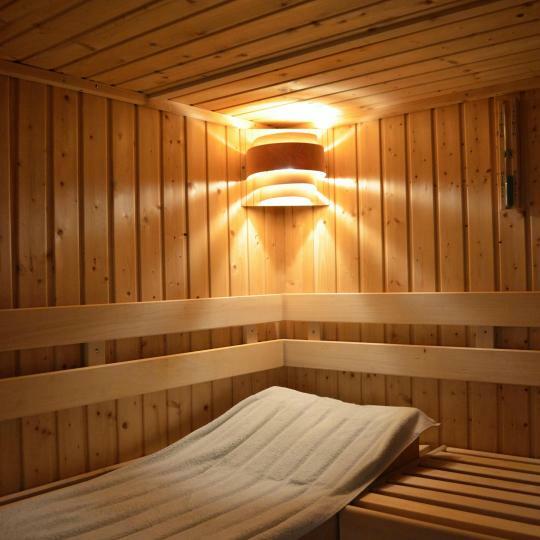 Hotel Wikinger offers a spa area and seasonal Northern German cuisine. Modern and clean room, friendly staff good location close to the beach. This hotel is located between Zempin and Koserow on Usedom island, just a short walk from the Baltic Sea and the Achterwasser. It features bicycle and canoe rental facilities. It was a wonderful stay and there is nothing we can complain about. Offering nonsmoking rooms and apartments with internet and a modern spa, 4-star hotel lies in Koserow, on the Baltic Sea island of Usedom. The coast is a 3-minute walk away. It's a great affordable hotel with seems to cater also for disabled guests. The family-run Hotel See-Eck offers comfortable accommodations and 2 separate restaurants in the town of Seebad Heringsdorf. It is just 328 feet to a beach at the Baltic Sea coast. This hotel is located directly on the beach in the quiet Baltic Coast resort of Ahlbeck, 0.6 mi from Ahlbeck Train Station. Hotel Villa Strandrose has a bike storage room and free parking. Set in a central but quiet location in the town of Ostseebad Heringsdorf, Hotel Fortuna is just 1640 feet from the Baltic Sea Coast. Free WiFi internet is available throughout the property. A spa area, buffet breakfasts and bright rooms with free Wi-Fi access are offered by this hotel. Just 492 feet from the Baltic Sea coast, it enjoys a central location in the seaside resort. Located on Bansin’s Fisher Beach and Beach Promenade on the Baltic Sea Coast, this 4-star hotel offers a spa area with 18-yard indoor pool and a large terrace with fantastic Baltic Sea views. Just 164 feet from the beach in Heringsdorf, this hotel features a sauna, a beer garden, and free WiFi. Good German standard if accommodation. Comfortable room. Excellent breakfast buffet. This historic hotel is a historic-style villa locatedon the Bansin beach promenade on the island of Usedom. Excellent view from the window. Right next the beach. Good breakfast. Nice weather! Centrally located in Heringsdorf, this family-run hotel is less than 1640 feet from the Baltic Sea coast. Great hotel. Good location. Nice clean rooms. Excellent breakfast. I'll be back. Set in Korswandt, Dorint Hotel Baltic Hills Usedom features an outdoor swimming pool. Featuring a restaurant, the property also has a garden, as well as a sauna. This 3-star-Superior hotel is an Art Nouveau villa located directly on the beach promenade in Zinnowitz. Located in the seaside resort of Trassenheide on the island of Usedom, this 3-star hotel offers cozy accommodations in 5 charming cottages, just 0.9 mi away from the beach. Set in a renovated 100-year-old castle, the Esplanade offers romantic accommodations 984 feet from the beach on the Baltic Sea coast. I liked the atmosphere at the hotel and the very friendly staff. Communication was easy and nice. This family-run hotel is located directly on Seebad Ahlbeck’s Strand Promenade along Usedom's sandy beach. The holiday destinations of choice for German emperors,Imperial Spa towns are a great place to treat yourself. Check out Bansin,Ahlbeck or Heringsdorf. Stroll down Heringsdorf Pier – Germany’s longest! Heringsdorf Pier stretches 508 m out over the Baltic Sea. Built next to the site of its 1891 wooden predecessor, the pier boasts a restaurant with a pyramid-shaped roof. Peenemünde’s Historical-Technical Museum is where the first ever missile was launched into space. 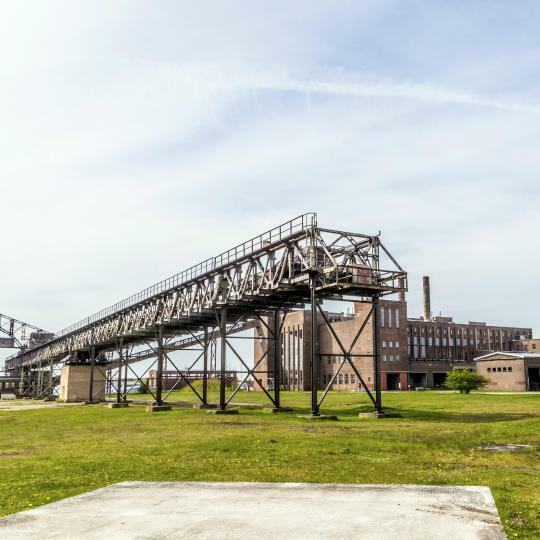 Today it offers insights into rocket testing during WWII and the Cold War. 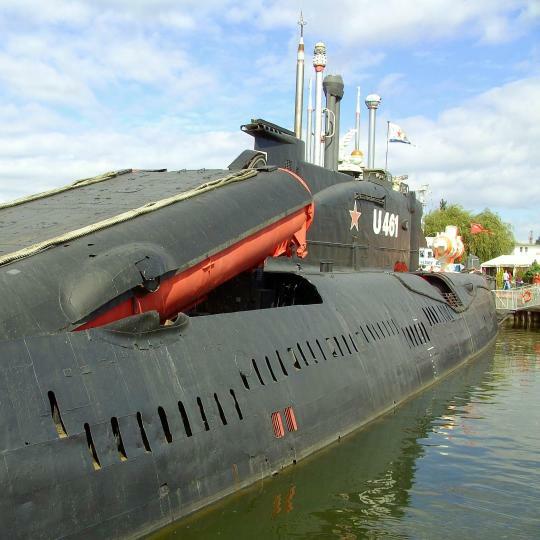 Peenemünde Submarine Museum is home to the Soviet-built U-461 submarine, floating peacefully in the harbour. Hop onboard for a fascinating look inside the cramped vessel. The Szczecin Lagoon connects Usedom to the Baltic Sea,and is the perfect backdrop for a romantic sunset. 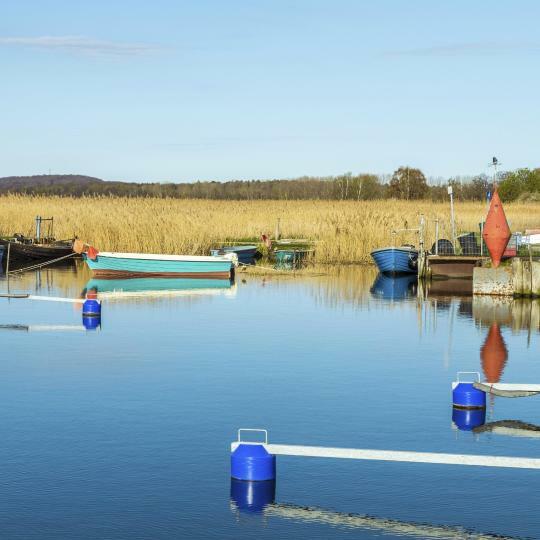 Boat tours, cycling and fishing are also popular activities. 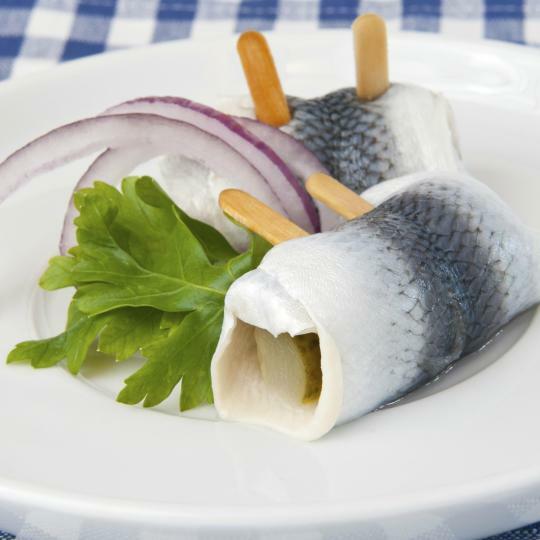 Restaurant Stellwerk serves up authentic Baltic Coast dishes. The herring pralines are a must try, a deliciously unusual combination of smoked herring and dark chocolate! 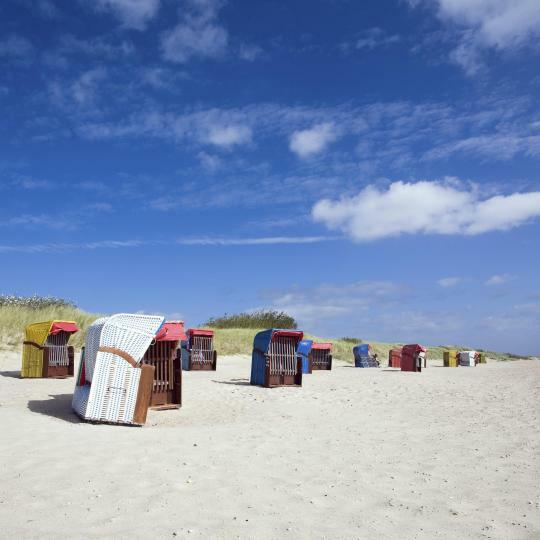 Germany’s Baltic Sea coast is dotted with popular ‘beach baskets’ – cute and cushioned wicker chairs. The XXL Strandkorb version is 6 metres long and seats up to 90 people. The Schmetterlingsfarm Trassenheide is Europe’s largest butterfly farm. 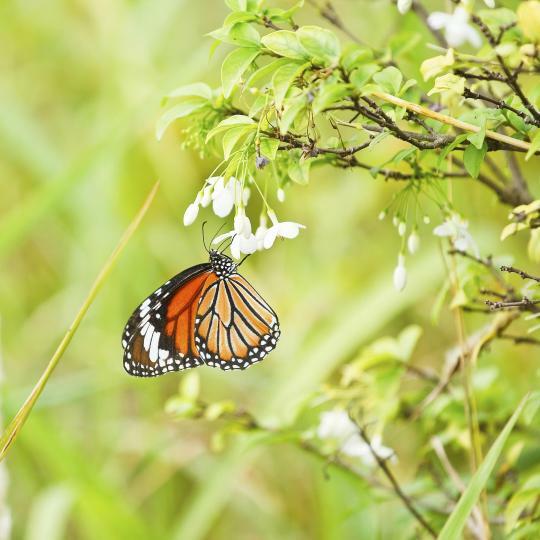 The impressive collection of butterflies and insects is a truly uplifting experience. With over 2.5 million visitors a year, the Ostsee ThermalBaths is a bathing wonderland. Bliss out with a selection of swimming pools,saunas and Balinese spa therapies. A comfortable, small hotel with friendly, helpful staff, great breakfast, good location-- everything you need for a relaxing beach vacation on Usedom. First off, the location is perfect. Not only are you a couple of steps from the beach, but you're also super close from where everyone gets together at night to have a drink, listen to live music and have a nice chat. The hotel itself is very clean, elegant and it has a milion things to do (sauna, winter garden, summer garden, pool, a bar with live music, restaurant, etc). Our room was very spacious, the bathroom was tidy and we had a beautiful terrace overlooking the sea. The bed was very comfortable, and I specially liked that you can choose from different styles of pillows according to your needs. Last but not least, the staff is amazing. My husband told them that we were going to celebrate our 2nd wedding anniversary and they went out their way to make this long weekend extra special. First, they upgraded our room totally for free, then they reserved and decorated a table at breakfast on our special day, and they gave us 2 glasses of champagne to cheer. Finally, they left a huge arrangement of red roses, pralines and a very nice card in our room, that we found when we came back from the beach. I really wish we could've stayed longer. I loved this hotel and we will be coming back soon!! The hotel was especially kid-friendly. The playroom is awesome -- it has climbing structures and slides and Bobby cars, so my three-year-old was just in heaven. There was a nice foam layer on the floor, so falling down wasn't a problem. The indoor pool was also nice -- there was a small kiddie pool that was perfect for my daughter. Restaurants as well as some museums were in easy walking distance from the hotel. The beach was very close, but as it was November, we only did a short walk along the shoreline. It's a great affordable hotel with seems to cater also for disabled guests. I found it to be at a great location, not much happening around, but if you are elderly, you will do very well, and if you are young, you will be able to spend a day or two in the little town at the sea without getting bored. The hotel is located in a quiet area and the hotel itself is quiet as well. The staff is very friendly and very caring. Breakfast was delicious. I can't complain about anything. Excellent location right on the beach with an incredible view of the pier, very friendly accommodating staff and superb atmosphere!! So glad I stayed here. Breakfast was super delicious and the location to the beach was great.